Mon deuxième look avec ce super poncho et mes nouvelles bottes. J’ai eu le plaisir de rencontrer la bloggeuse Helen, alias Boho Tailor. Cela fait un petit moment qu’on se suis sur instagram et quand elle est venue sur Paris c’était l’occasion parfaite pour se rencontrer et prendre des photos. My second look with this beautiful poncho and my new boots. I had the pleasure of meeting fellow blogger Helen from the blog Boho Tailor. We have been following each other for a while on instagram so when she came over to Paris it was the perfect time to meet and take some photos. It was SUPER cold when we shot this look so I was happy that I had wrapped up in my oversized jumper and thick tights. We fell in love with the location as soon as we saw it… Place Vendome looked so special when it lit up like a christmas tree. Mon deuxième look avec ce super poncho et mes nouvelles bottes. J’ai eu le plaisir de rencontrer la bloggeuse Helen, alias Boho Tailor. Cela fait un petit moment qu’on se suis sur instagram et quand elle est venue sur Paris c’était l’occasion parfaite pour se rencontrer et prendre des photos. Il faisait SUPER froid quand on a fait ce shoot, j’étais donc bien contente d’être bien au chaud dans mon pull et mes bas bien épais. Nous sommes tombées amoureuses de cet endroit dès que nous l’avons vu… Place Vendôme prend une allure spectaculaire quand elle est illuminée comme un arbre de Noël. The cape is so nice, and I love the bag too! 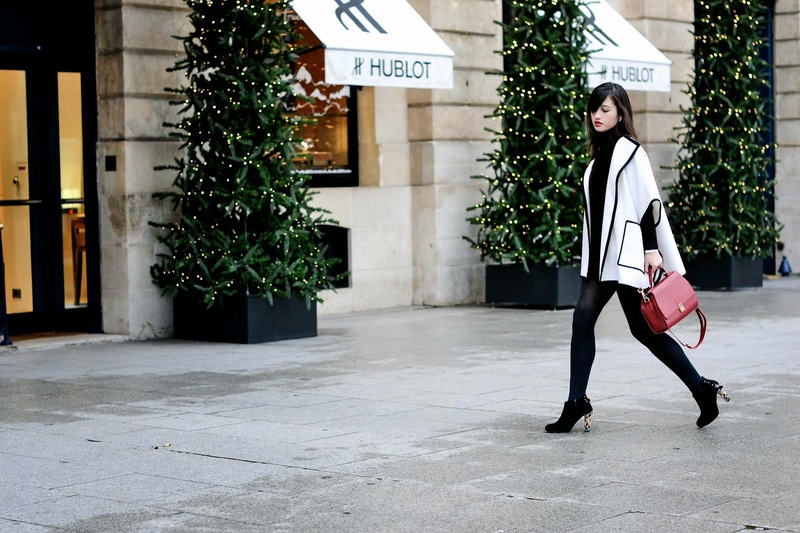 I like how you put together this black and white poncho, burgundy bag and those adorable boots - whole outfit looks awesome! 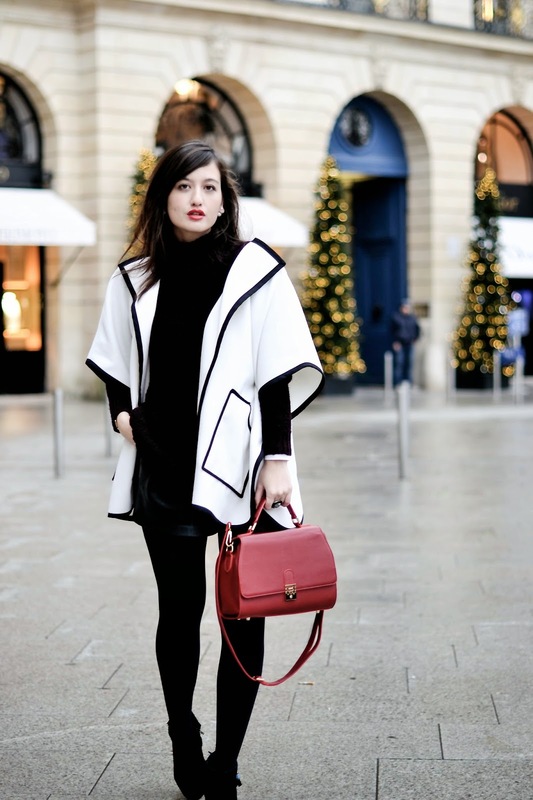 The cape and red bag look so chic and the boots add the perfect touch of fun ... love it! Omg I love these photos with the christmas lights, so magical! superbe, comme toujours vraiment élégante! Oh la la ce look! Magnifique! j'adore ton poncho et tes chaussures !! !